Folks sometimes wonder what became of Jonah after he was stuffed and mounted. We do know that he ended up in an amusement park, but the last time his body was seen was in Kingdom Come residing in the Planet Krypton restaurant. Some folks have stated that since Booster Gold, the owner of the establishment has personally met Jonah, that perhaps he'll finally give the bounty hunter a decent burial. But Kingdom Come is an alternate reality (right? I'm not sure anymore) so I'm inclined to state that this is not the final time we'll see the corpse of Jonah Hex. Frankly, that scene in the restaurant afterwards is my favorite part of the whole Kingdom Come storyline. Poor Jonah. He really ought to be in a diorama instead of just a glass case. 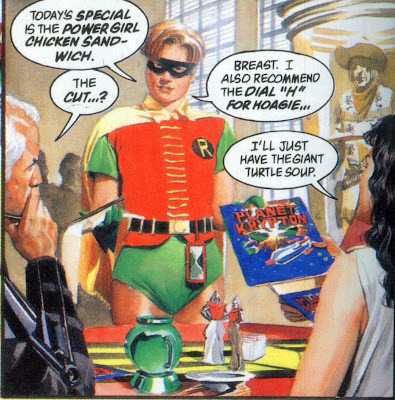 I just love that the cut of the "Power Girl" sandwich is breast. I just can't imagine trying to eat lunch with Dead Jonah glaring down at me.